Sandersonia, otherwise know as Chinese Lily Lantern or Christmas Bells, is a climbing bulb which produces masses of gold, bell shaped flowers in Summer. It prefers well-drained soil in full sun to part shade. Our nursery will provide you with a u-shaped, two prong bulb as shown in the image below. Some nurseries snap the Sandersonia bulb in half giving you only one growing point. The growing points are the two ends of the u-shaped bulb. 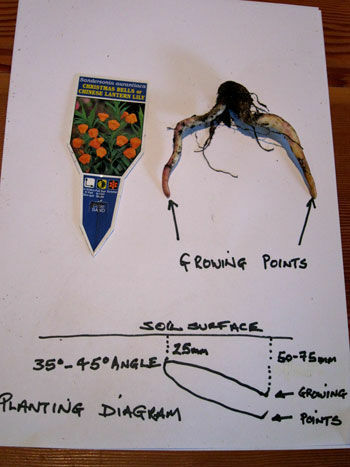 They are to be planted with the 'u' part of the bulb, 25mm (1") below the soil surface, and the two prongs on a 35 – 45 degree angle, 50 – 75mm (2" – 3") below the soil surface. See the planting diagram. Sandersonia bulbs have only one flowering life, but the bulb produces two new growing points per prong. So the bulb pictured will produce four new growing points next season, while the original growing points will die. We recommend leaving the bulb in the ground (unlike the suggestion on the label) and not disturbing it/them after the flowering season. Sandersonia's are clumping plants. Water bulbs when green shoots appear above the soil surface.